This is a university, but it is also a community—one that lasts a lifetime. Yalies from throughout the generations and around the globe are part of a constellation centered in New Haven. Yale is a place that draws students, faculty, and staff from richly diverse backgrounds; opens its doors to its city and regional neighbors; and shares its treasures and ideas with the world. Yale’s approach to research and to liberal arts and science education transcends traditional disciplinary and physical boundaries, yielding new ideas that could not occur elsewhere. For more than three centuries Yale has been rooted in the pursuit of excellence, guided by a commitment to outstanding research and scholarship, education, preservation, and practice. Yale University is more than just a place to study or to work. It is a place that brings people together—students, alumni, faculty, staff, and local residents—and binds them in a community committed to the shared pursuit of knowledge. 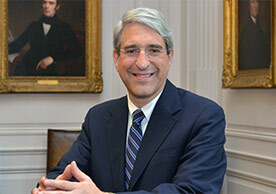 As the university’s 23rd president, Peter Salovey works with all members of this community to build a more accessible, more innovative, more unified, and ever more excellent Yale.